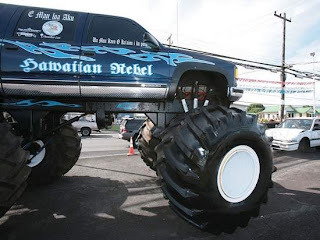 Hilo Chevrolet, of Hawaii, decided to roll-over their Asian competitors Honda and Hyundai by throwing monster truck wheels on a Chevy Suburban as a way to crush the competition. Unfortunately, the demonstration backfired when the Suburban blew a hydraulic hose and leaked vital fluid while the Honda remained waiting for more. This just a week after a Ford dealer in South Carolina insulted Asians with his rant about Japanese cars being "Rice Ready, Not Road Ready." I get the not road worthy part, but what the hell does "Rice Ready" mean? It's another example of a gregarious dealer trying to show his triumphant patriotism in an idiotic manner. With all of the fear and worry mounting from a month of bad Big Three press and questions surrounding a Bailout (that thank heavens finally came through), it is of little surprise that local marketing departments have lost their minds. The problem is neither of these two examples help the U.S. auto cause and, at worse, backfire. American cars have a poor history that many of us remember who owned 1970s and 1980s models. Repairing the reputations has been a tough road, but the good news is that quality issues have lessened dramatically, high safety ratings are not exclusively denominated by any country, and style is improving. It's just sad that some dealerships are losing their minds and making their brands look as bad as the all the complainers against them. What the U.S. auto manufacturers need is more myth busting around poor quality and less patriotic flag waving. People who do not work for a brand buy a car because it is the right choice for their needs and expanding some minds by showing American brands are worth looking at, because it's not 1985 anymore, is a good thing and good for a healthy competitive marketplace. So please park the monster truck and no more name calling.